On my last visit to Paris, with great anticipation, I went to see the William Klein retrospective at the Polka Galerie in Paris. The gallery has a warm, close relationship with Klein which was obvious in the exhibition. This was not a cold retrospective where photographs are reverently lined up on white walls so that we may admire them in hushed tones. This exhibition reflected not only Klein’s oeuvre, but also his personality. “Anything goes” he likes to say - this does not mean anarchy, uncaring photography, but rather daring photography but always with a smile or a cheeky approach to the subject. This was reflected in the manner the retrospective was curated: photographs crammed together where it was appropriate, others standing on their own on a white wall. Klein’s career is well documented: it has so far spun street photography to reportage via fashion. I am a huge fan of his work and he has influenced many remarkable photographers including Daido Moriyama (which whom he had an exhibition at Tate Modern in London a few years back), Jacob Aue Sobol and so many others. What struck me as I toured the exhibition a few times is that this seems very much work in progress. I mean that one does not get the sense that this is it; Klein (who recently celebrated his 90th birthday) is still producing work, photographing and I understand has picked up the brush again on occasion, sometimes mixing photography and painting. This is a true artist enjoying every second of life to its fullest. I can’t in this blog summarise Klein’s career so far: it extends far beyond photography to cinema, and even sculpture and paintings in his early days. I can only recommend his many books (the book “Life Is Good And Good For You In New York” is in my opinion on par with “The Americans” by Robert Frank as seminal books in photography). If you wanted to have a look at one book only, I would recommend the recent book published (in French only I believe) by Polka Galerie with Editions Textuel for this exhibition: it covers Klein’s career but most interestingly with short (often cheeky) introductions for each chapter by Klein himself which will give you a sense of his approach and the man. (I could not find the book for sale on Amazon or in my usual photography bookstores, but the Galerie has it for sale. The title of the book is simply “ William + Klein”). I must here also mention Polka Galerie. I regularly go to photography galleries. Some seem like stuffy sanctuaries; others welcome you; a few owners have friendly chats with you. But Polka Galerie must be one of the friendliest, most approachable, knowledgeable galleries. 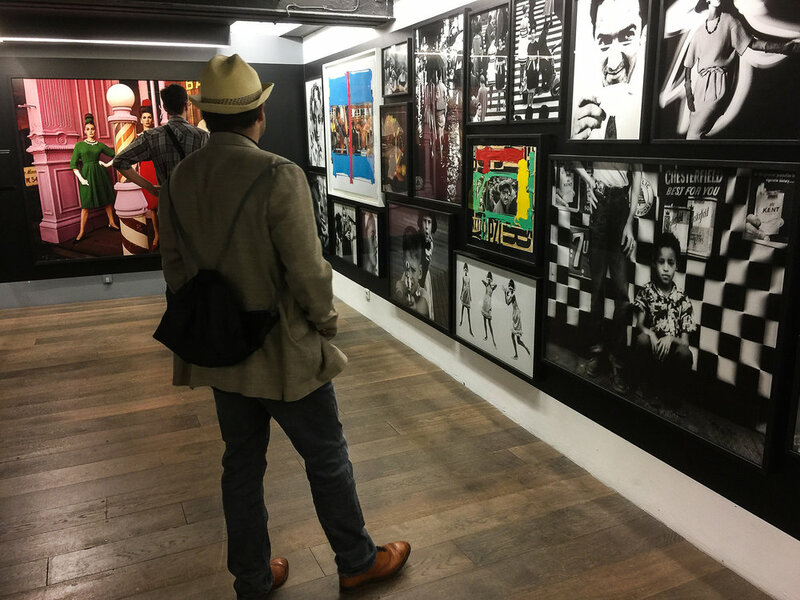 It is located in the heart of the Marais in Paris and once you go through the first room of the gallery you enter the courtyard where you will find the bigger gallery in a typical Parisian setting. Of course there is never enough time when visiting Paris, but do try to pop by this gallery and then maybe make your way to the Picasso Museum and have a quick lunch at one of the Marais’ cafes and restaurants (the Sévigne for example has wonderful vegetarian homemade tarts and it is a neighbourhood brasserie with a few tourists and plenty of locals). A couple of years ago I saw William Klein at Photo London going around the exhibition. He was very approachable and gave me a chance to thank him for his work. I have no selfie with him (it did not cross my mind); rather I have a smile, a twinkle in his eyes in my heart and plenty of inspiration.